Upcycling is a form of recycling. When a product reaches the end of its lifecycle, it is converted into a new high quality product, or is dismantled and it’s parts are recycled into several high quality products. 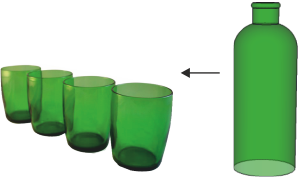 Normal recycling often results in a product being dismantled and recycled into lower quality products (called downcycling). When upcycling, the new product is of a higher quality than the original product. These quality drinking glasses have been upcycled from glass wine bottles. The top of the bottle has been removed and sent for recycling into new glass. The bottom part of the bottle becomes the drinking glass. This shoulder bag has been upcycled from vinyl advertising billboard skins, seatbelts, street banners and fire hoses. 1. In your own words, what is UPCYCLING and how does it differ from normal recycling? 2. Describe two products that can be regarded as being the result of upcycling.